Chelsea to beat Manchester City for Wilfried Bony Chelsea have entered the race to sign Premier League prolific striker Wilfried Bony, according to Daily Star. 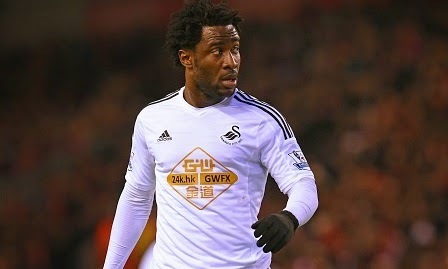 Chelsea have entered the race to sign Premier League prolific striker Wilfried Bony, according to Daily Star. The Blues boss Jose Mourinho has set his eyes to beat the Defending Champions Manchester City who are also in the race to sign the Swansea City star striker Bony. Mourinho is eyeing Bony despite of having Loic Remy, Didier Drogba and Diego Costa in his ranks. The Portuguese manager has sent the scouts to keep an eye on his situation. Chelsea striker Drobga also wants to team up with his compatriot at Stamford Bridge. While Manchester City are in need of a striker as their top scorer Sergio Aguer is out along with Edin Dzeko. Swansea however are keen to keep their talisman but will not block his move if the right offer comes. Manchester City are ready to offer 24 million pounds but with Swans manager Gary Monk said that he wants 30 million pounds for the Ivorian striker. Bony is likely to move either to Manchester or London this month. However, he will not be a regular player for either of these sides. The Ivorian has been superb for the Swans since his move from Vitesse in 2012. He has netted 34 goals in 70 games.